The BN-2 Islander prototype, G-ATCT made its maiden flight on 13th June 1965. Islander G-BUBP made a special re-enactment flight at exactly 14:18 (the same time as G-ATCT took off 50 years ago) to celebrate the Islander's success. The new Islander G-CIGM left Bournemouth today after being painted in the colours of customer FLN - Frisia Luftverkehr of Germany. Britten-Norman has committed to a series of work place initiative aimed at continuing to strengthen work benefits to invest in the fu ture of the company. Read more here. 25.3.15: a brand new Islander, BN-2B-20 G-CIGM (cn 2312) was seen undergoing taxy trials at Lee -on-Solent today. Thanks to Rich Davies for the picture. We believe that G-CIGM flew for the first time on 24th April 2015. 11.2: B-N Group issued a statement that they have returned to profitability and have a full order book. Read more here. February 2015: The Islander will be a feature of the next James Bond film, Spectre. Filming has been underway in Austria since late 2014, and pictures have leaked onto the internet - see links below. There are up to six non-flying airframes used in the production stunts and two flying aircraft. We bring more news when we can. Britten-Norman is promoting what it describes as “affordable” and “entry-level” C2/ISR configurations of its evergreen BN-2 Islander and Defender twin turboprops. At the recent Farnborough Airshow, the company displayed a BN-2T-4S, "Defender 4000", that it said is best suited for the role. High maintenance costs and rising unreliability means planes flying to Alderney "must be replaced by the end of the year", it is claimed. Six Trislanders, operated by the Guernsey States-owned airline Aurigny, currently fly from Alderney to Guernsey and Southampton. Aurigny chief executive Mark Darby said: "The cost of keeping them in the air is now prohibitively expensive." The purchase of three second-hand Dornier 228 is expected to cost £3m. Treasury Minister Gavin St Pier has asked the government to guarantee a loan or lend the airline the money. Marshall Aviation Services, part of the UK’s Marshall Aerospace and Defence Group, has been named a preferred supplier by Britten-Norman for exterior paint work on up to 15 Islander and Defender aircraft. Under the one-year agreement, Marshall Aviation Services will paint both new and refurbished aircraft at its Broughton, North Wales facility. Marshall Aviation Services completed work on a the first newly painted Islander, G-CEUE, last month. Marshall Aviation Services offers a two-bay paint facility and paint design service capable of handling up to three super-midsize jets simultaneously, up to the size of the Falcon 2000. The paint facility is complemented by a design studio offering a full upholstery and trim service for seats, divans and other interior needs, all of which is supported by EASA Part 21 design organization approval status. In addition to interior and exterior refurbishment, the Broughton facility provides MRO, aerostructures, avionics, design engineering and modifications. Saturday 15th March will see the last Trislander flights between Guernsey and Jersey. From Sunday 16th March, Aurigny Air Services will operate a codeshare service with Blue Islands - meaning passengers with either airline will be buying seats on Blue Islands' larger plane. Aurigny MD Mark Darby admits some people will be sad to say goodbye to the iconic planes on the busy route - but he says it is time to think about moving on completely. The Trislander is scheduled to be withdrawn from all Aurigny route by Autumn 2014. Aurigny's most iconic Trislander, G-JOEY, named after a series of children's books about "Joey the yellow Trislander" is the subject of a campaign to either keep flying or be preserved in some way. See the special facebook page. 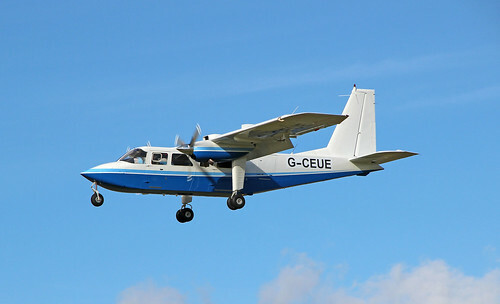 The first new BN-2 aircraft from Lee on Solent was the BN-2T-4S G-CGTC and a report can be seen here. Last summer (2013) German Islander oprerator OFD, based at Bremerhaven, acquired two Islanders from Milford Sound Flightseeing in New Zealand, Islanders ZK-MSF (msn 2037) and ZK-TSS (2043) then undertook a long journey from New Zealand to Germany. You can read about it here. It is in German text, but on line translators should be able to help! Picture below is from www.abpic.co.uk shows ZK-MSF as D-IOLM in service with OFD at Emden on 13th February 2014. St. John's, Antigua -- The Montserrat-based airline FlyMontserrat has now taken over the Antigua to Nevis route with effect from Monday. LIAT pulled out of the route earlier in the month and FlyMontserrat replaced them, in a contract negotiated with the Nevis Island Administration to provide twice daily services, five days a week using its Britten Norman Islander aircraft. Initially the service will operate on Mondays, Fridays, Saturdays and Sundays with the addition of a Wednesday service beginning on 22 January 2014. The service will allow passengers to transfer to Europe, North America and the rest of the Caribbean through the Antiguan gateway. Base single fares have been set at US$165 plus taxes. Managing director Nigel Harris on Monday met hotel owners, agents and officials and was delighted to be returning to Nevis. “The Nevis Island Administration has been pro-active in trying to seek a replacement to LIAT at a difficult time of year and at short notice. I hope this will lead to a long-term relationship with the Island; that the service will be well-used and we can expand air services further at some time in the future,” Harris said. FlyMontserrat has been operating in the region for nearly five years, flying scheduled services, mainly out of Antigua and Montserrat. It also flies charters throughout the Caribbean, carries freight and offers medevac facilities. Aurigny Airlines plans to order two or three Dornier 228s to replace its fleet of ageing Britten-Norman Trislanders, following a successful two-week trial, says the UK regional carrier's chief executive. Mark Darby tells Flightglobal Pro that the 228's ability to operate during poor weather conditions was a key test during the trial, and that its performance was such that “we are not looking at anything else” as a replacement for the Trislander. "We had some severe weather, particularly in Alderney recently, which is one of the most difficult parts of our operation. While the Trislanders were grounded because of crosswinds, the Dornier was able to operate," he says. The two-week trial of the 228, which was leased from Portugal’s Grupo 7 Air, began on 13 November. The aircraft was deployed on Aurigny’s scheduled inter-island services and one Bristol flight. Darby says it is "too early to say" whether the aircraft will be purchased or leased, but he is confident the process will be completed by the second half of 2014. The Aurigny chief is now drawing up a business plan for approval by the States of Guernsey, which owns the airline. Update Feb 2015: Reports state that up to 3 Trislanders could continue in use until early 2016.